Is QuizFactor a Scam? Read 2 Reviews! 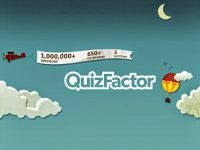 QuizFactor Exposed — Will You Get Scammed by Taking Quizzes? Clicking on the different quizzes at QuizFactor is a riot. There are so many different games to test your knowledge in a variety of areas from geography to Harry Potter books. But why do they do it? Quizfactor.com is a site that doesn’t seem to actually lead to prizes. Does that sound weird? Yup! Mostly, it seems it wants to lead you to their sister site My Offers. The quizzes themselves are a heap of fun. So let’s look deeper. QuizFactor is a site that offers quizzes to complete. Players get ranked and can climb up and down on a Leaderboard. It’s hard to figure out at first why they are doing this. There is no immediate information on what you can win. What this site does do is link to another site called My Offers. This is a prize site for a variety of things. Every game you play opens up a window linking to MyOffers.co.uk. The quizzes themselves are pretty cool. There are all kinds of different quizzes that will test your knowledge. It’s a nice feeling to score good. There is a chat room where people can discuss things, though I’m not sure why you’d sit on this site and do that – unless you are lonely. We did have a chuckle reading in the terms and conditions “If someone is having a lucky day and you’re not doing so well, don’t give them a hard time. We all have lucky days as well as bad ones”. So why are they doing this? Quiz Factor collects information on you and where you travel on the web. They will also send you advertising in the form of promotions and offers – and want you to go to their sister site. Most importantly, you have to be a resident of the UK to take QuizFactor.com quizzes. They do qualify this with “unless the Company determines otherwise”. You also have to be 18 years or older and not work for the QuizFactor or any of its affiliates. What Are the Prizes Offered by QuizFactor? There doesn’t seem to be any prizes directly here at this site. It’s simply a bunch of quizzes. It appears that it’s only when you get into their sister site, My Offers, where there are things to win. The Quizfactor.com website is managed by Quiz Factor Limited (“Quiz Factor”), a company with an office at 46 Gillingham Street, London, SW1V 1HU. Players at QuizFactor can only have one account and you must use your real name. If you don’t go into your account for 90 days, they’ll take a 20% admin fee. I’m not sure how they take that as quizzes are free so no money paid. This might have something to do with getting into their sister site of My Offers – myoffers.co.uk. There are no prizes to collect here. It seems players simply climb up and down the Leaderboard and that annoying little window pops up each time you try a quiz – yup My Offer. Reading through the comments on the site, it is easy to see why they add a comment in the terms and conditions to ‘play nice’. One person complained that they hadn’t moved up any levels after playing 120 games and someone commented “you’re not smart”. Is QuizFactor.com Scam or Legit? This site looks legit in that it is simply a quiz site to draw you towards their sister site myoffers.co.uk that does offer a heap of ways to win prizes. Quiz Factor can be linked to other sites (yup, have come across this before). If you’ve got the time to sit and click, then going through some of these quizzes is good fun though the pop up window for Myoffers.co.uk does get annoying. Are You Really That Lonely? This site is hilarious with the quizzes and they can be very addictive – like when do you stop. At the same time, why are you wasting your time here. If you’re into winning prizes, go straight to their sister site of Myoffers.co.uk and play there. I used to love Quizfactor and was addicted to it but what happened, where did it go, am I missing something? BTW I was clearly one of the few who DID win a prize of an iPod (approximately 4-5 years ago) and they put a photo of me up on their site!